Tartan describes the characterising checked pattern of the Scottish woolen kilts. the geometric shape are the result of the combination of horizontal and vertical lines which again and again create new shapes. This way, the inspiration for the design of the Tartan Pendant Lamp by the designers Ludovica and Roberta Palomba arose. For its manufacture, the glass is blown into a shape that offers line-like notches. This way, the characterising checked patterns arose on the lampshade, creating unique highlights with the play of light and shadow. Additionally, the glass is treated with an acid whereby a soft, velvet surface is created. Whereas there is more subdued, warm light coming through the glass sphere, direct light is shining through an opening at the bottom of the lampshade, specifically illuminating the surface below, for example dining tables or living room tables. The Tartan Pendant Lamp presents itself a little playful but still very elegant and therefore, fits in any living area and ambiance. The lamp is available in different variants, also as a LED with or without dimming function. 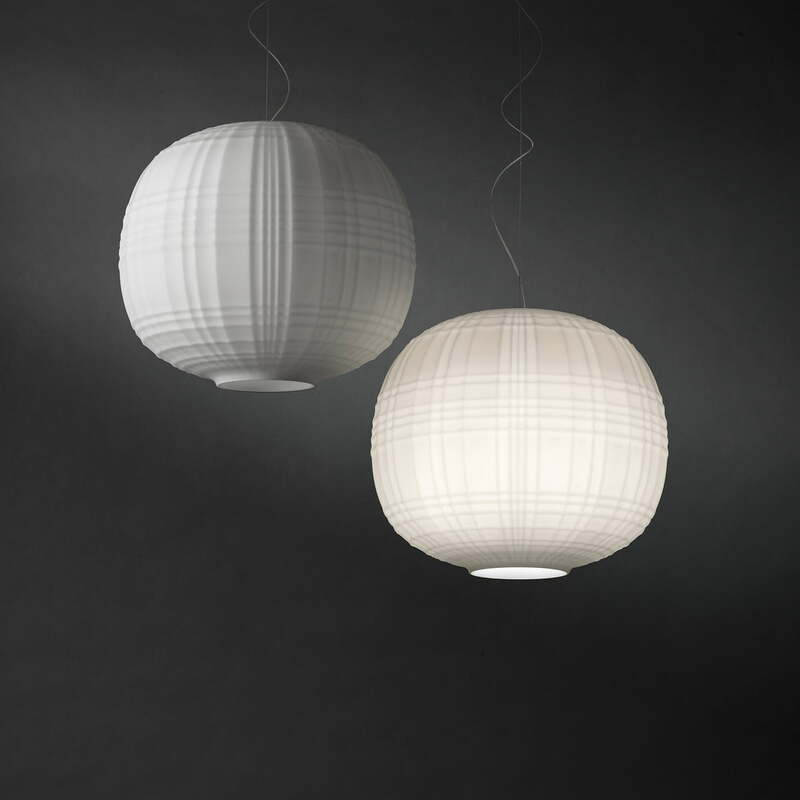 Single image of the Tartan Pendant Lamp in white by Foscarini. Mouth-blown glass with checked pattern in the style of Scottish woolen kilts guarantee that the lampshade becomes an absolute eye-catcher. 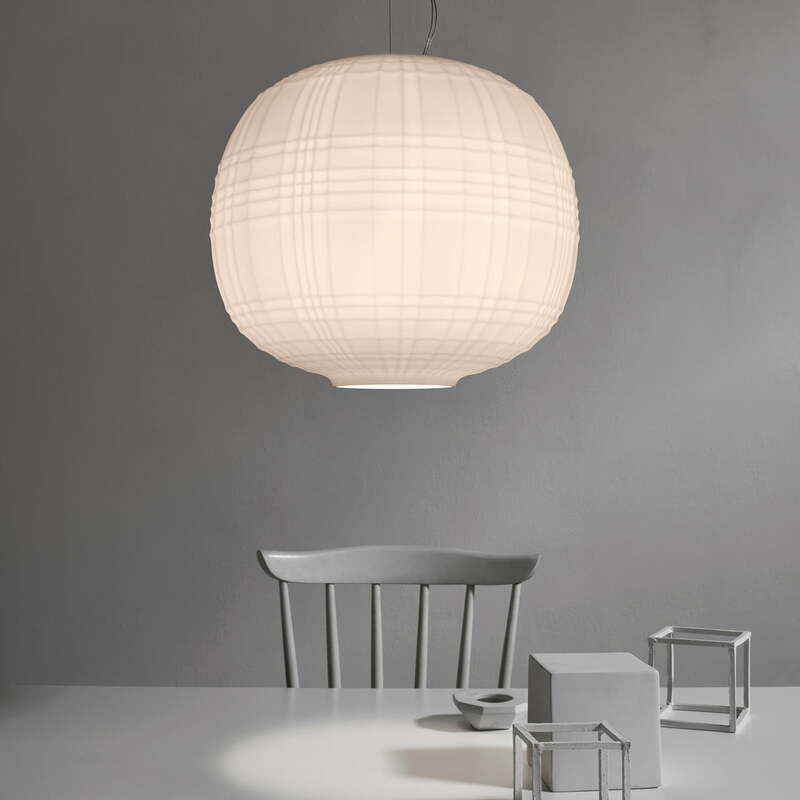 Ambience image of the Tartan Pendant Lamp by Foscarini. Also in a combination with further lamps and suspended in different heights, the Tartan Pendant Lamp creates cosy, indirect light. Ambience image of the Tartan Pendant Lamp by Foscarini. With switched-on light, the checked pattern becomes particularly visible on the lampshade - Creating special highlights with light and shadow. 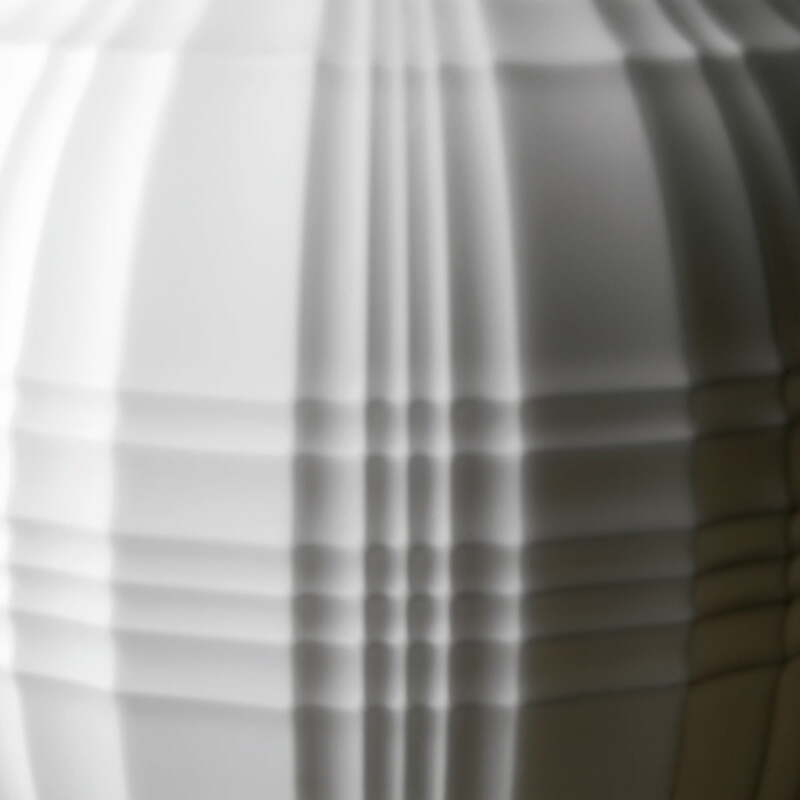 Detail view of the Tartan Pendant Lamp by Foscarini. The shapely mouth-blown glass was additionally covered with a special acid, leaving a soft, smooth surface.